Slacker Blogster | NJNA is Blogging! Perhaps you had to be at our opening banquet to appreciate that last remark! Anyway — some of you know that I recently accepted a job as project manager for a submarine cable project in northern Alaska! So in between stitching, I have been taking conference calls, reading permit applications, and trying to be responsive to a myriad of questions from all quarters. Frankly, it’s exhausting. The main canvas for “Colorful Croton”. One of the steps in this is “coloring” the canvas from white to this lovely purple-blue-gray color! There are three different blackwork patterns on the large croton leaves! The small leaves of the croton are also done in a blackwork pattern! 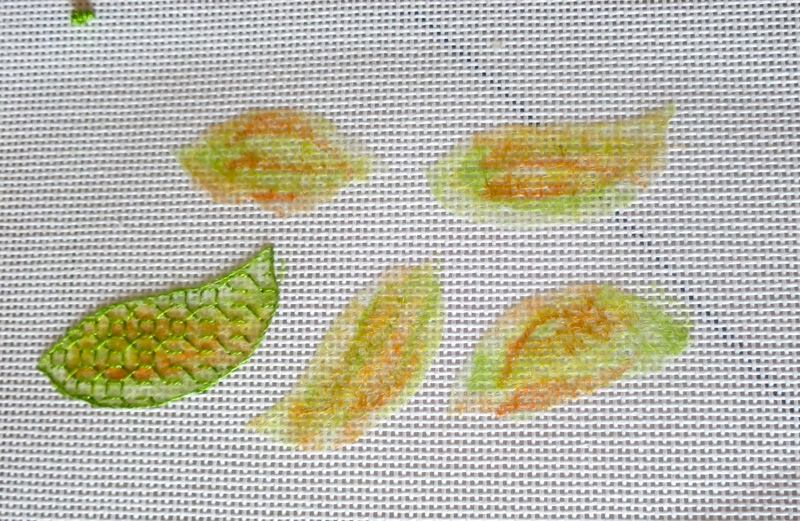 These leaves will be cut out of the canvas and tacked to the main canvas. But first I have to put bright red-orange veins on ALL of the leaves! 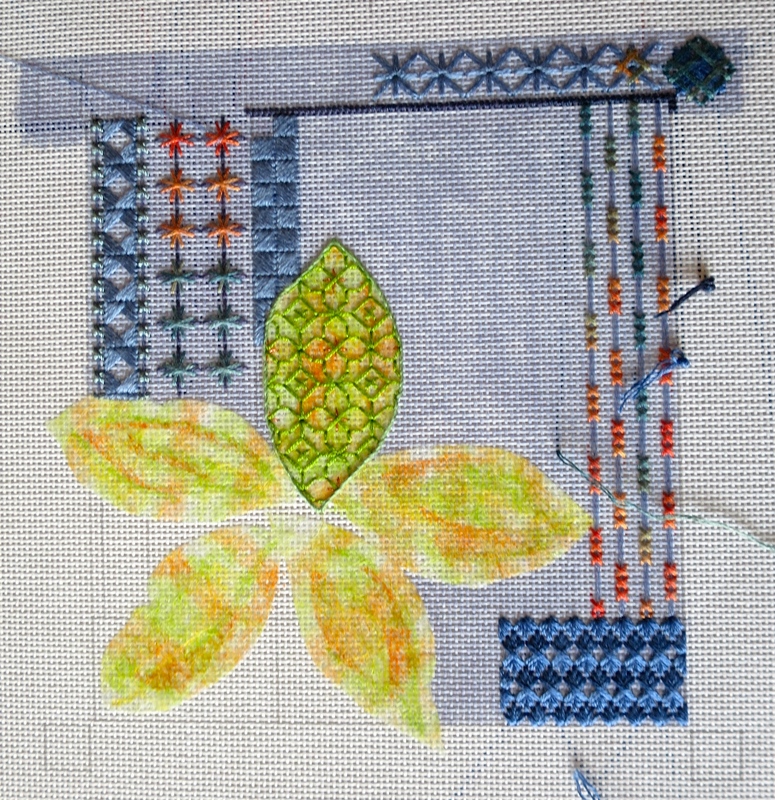 Today I started a new class, “Tudor Garden”. The class was supposed to be taught by Merrilyn Heazlewood, but when her visa didn’t come through to support her travel from Australia, Susan Hoekstra stepped in to moderate the class with Merrilyn checking in and demonstrating the project using “Go to Meeting” software. It’s a valiant try by ANG to make the best of a tough situation. Susan is past president of our NJNA chapter who recently moved to Maine, so it’s great to be spending the two days with her! I think I just liked the look of all the colors in Tudor Garden. It is a delight to stitch, fairly easy, but with wonderful colors and threads! This is the first time ANG has tried “distance learning” (or so they tell us) and there are a few kinks still to be worked out. One is getting the right combination of lighting for stitching and darkness for projecting Merrilyn on the screen! The extra spotlights helped the first issue but made the room awfully hot! But it’s exciting to be part of this experiment and we are happy to listen to Merrilyn’s lovely Australian accent! Tonight our group was torn in many directions with meetings of chapter officers, cyberpointers, and other meetings! 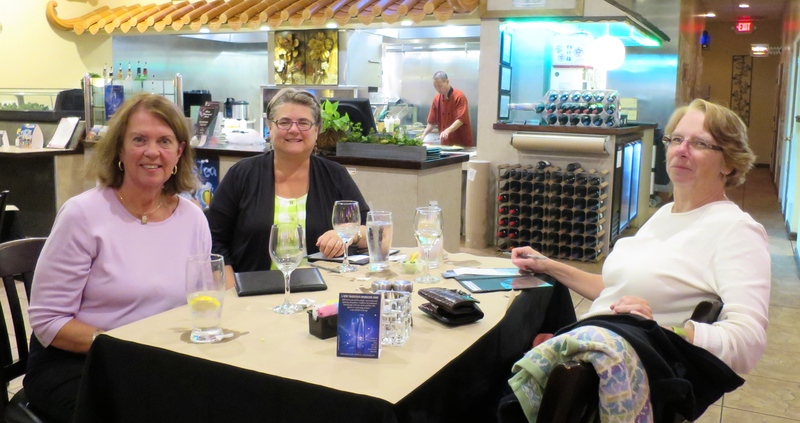 So Carol, Diane, and I found a Teppan Yaki restaurant and enjoyed a delicious Japanese Hibachi dinner. It wasn’t cooked at our table, but it tasted as if it had been! And, yes, Meg — I had sake! Our waitress even brought me slices of cucumber to float in the glass! Time for Slacker Mom to put in those tent stitches for tomorrow’s 8:00 AM class!